Do you own a Demat account? If yes, let us learn how to do Intraday trading today. 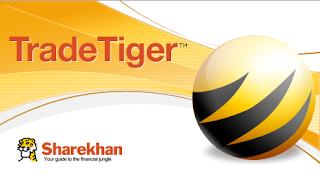 In this article we will be using Sharekhan's most popular trading platform called Trade Tiger to explain intraday trading technique. Click here to download Trade Tiger software from Sharekhan website. In intraday trading a trader buys and sells shares on the same trading day and makes profit independent of the market direction. 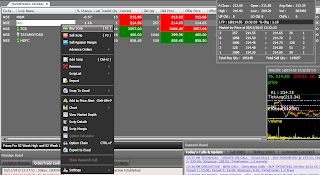 For intraday trades the brokerage charges are very small compared to normal trading. Also you will get your capital back at the end of the trading day. Choose the shares which have high liquidity and volatility. Liquidity is nothing but the volume of shares traded for the day. High liquidity ensures there are enough buyers and sellers for a particular stock. A volatile stock moves up and down fast helps to book good profit easily. First log into your trading account with your account password and trading password. Add the script you want to trade onto MarketWatch. Then right-click the script and select Buy Script. This will open up a new order window. For market orders, enter 0 or your limit price in the Price field. Then enter Quantity and click on Place button. Your order will be sent to the exchange immediately and executed based on your order type. Once the order is executed, immediately keep a stop-loss for your order. This will limit your losses if the script is moving against your trade. Go to Order details, right-click the script and click on Square-Off. 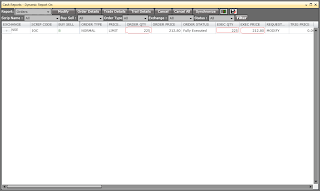 This will bring up a sell order window with the script name and quantity populated. 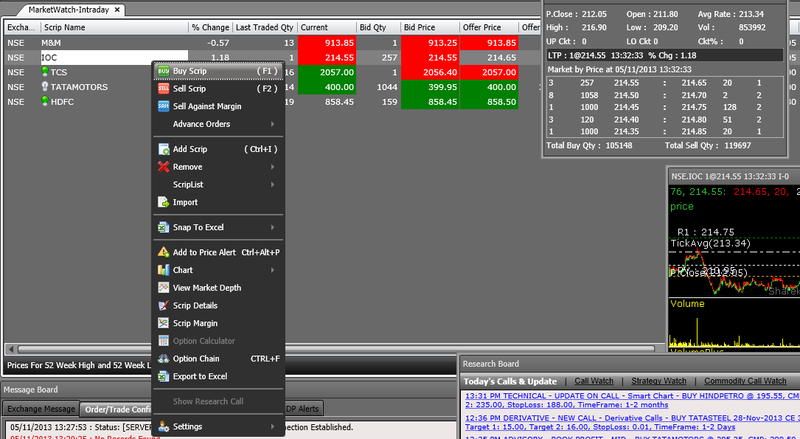 Enter your stop-loss value in the Trigger Price and click on Place. 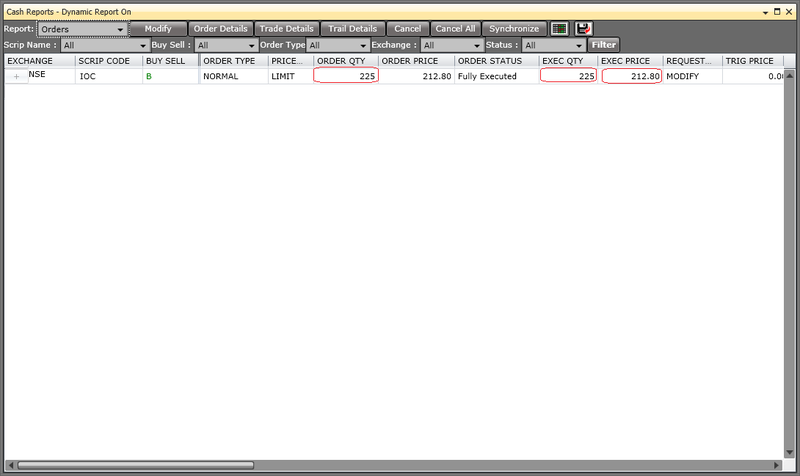 Sharekhan will send your sell order to exchange whenever the script touches your trigger price. Keep on adjusting the stop-loss trigger price until the script reaches your target price. Or you can place another sell order with a limit price but make sure to cancel the second order once the first is executed. Similarly you can place Short-Sell orders for scripts which are going down. Keep appropriate stop-loss trigger price for sell orders too. Server is busy, Kindly re-login after sometime - This happens normally when the software is not able to connect to ShareKhan server. Reason could be because you are behind your company firewall. Intraday trading may make you richer but if traded without stop-loss you will end up in huge loss. Beginners, test your trades on paper first, then once comfortable, start trading with your Demat account. Happy trading! What is the intraday limit of sharekhan? Does any one tried Share Trading League by ITL ? Finally found a please where my most of the doubt have been cleared. whene ever i add a scrip(for intraday trade) it shows position type LONG.......?? but i sell that scrip within a day for very low profit .........im using mac so no trade tiger on apple system any help...??? in simple how to do intraday trading without trade tiger????? How to buy back after a short sell? You can place a normal buy order(Good for the Day) with the same quantity.